Designed to lead the user on a one-day tour of one of the most important battlefields of the war, the guide provides precise directions to all the key locations in a manner reflecting how the battle itself unfolded. A wealth of maps, vivid descriptions, and careful but accessible analysis makes plain the sweep of events and the geography of the battlefield, enhancing the experience of Shiloh for the serious student, the casual visitor, and the armchair tourist alike. About the Authors: Mark Grimsley is a professor of history at Ohio State University. He is the author of And Keep Moving On: The Virginia Campaign, May–June, 1864, and the co-editor of Civilians in the Path of War, both published by the University of Nebraska Press. Steven E. Woodworth is a professor of history at Texas Christian University. He is the author of Chickamauga: A Battlefield Guide and Six Armies in Tennessee: The Chickamauga and Chattanooga Campaigns. 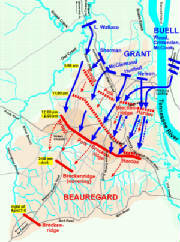 But out of the struggle, Grant and Sherman forged their own union that would be a major factor in the Union Army's final victory. For the Confederates, Shiloh was a devastating disappointment. By the time the siege was over, they had lost both the battle and one of their ablest commanders, Albert Sidney Johnston. Eyewitness accounts by battle participants make these guides an invaluable resource for travelers and nontravelers who want a greater understanding of five of the most devastating yet influential years in our nation's history. Explicit directions to points of interest and maps--illustrating the action and showing the detail of troop position, roads, rivers, elevations, and tree lines as they were 130 years ago--help bring the battles to life. In the field, these guides can be used to recreate each battle's setting and proportions, giving the reader a sense of the tension and fear each soldier must have felt as he faced his enemy. 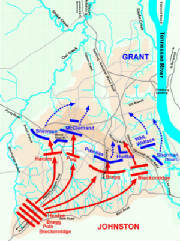 This book is part of the U.S. Army War College Guides to Civil War Battles series. Confederate general Albert Sidney Johnston was wounded and bled to death, leaving P.G.T. 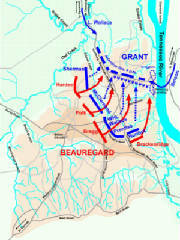 Beauregard to disengage and retreat with a dispirited gray-clad army. Daniel (Soldiering in the Army of Tennessee) has crafted a superbly researched volume that will appeal to both the beginning Civil War reader as well as those already familiar with the course of fighting in the wooded terrain bordering the Tennessee River. His impressive research includes the judicious use of contemporary newspapers and extensive collections of unpublished letters and diaries. He offers a lengthy discussion of the overall strategic situation that preceded the battle, a survey of the generals and their armies and, within the notes, sharp analyses of the many controversies that Shiloh has spawned, including assessments of previous scholarship on the battle. This first new book on Shiloh in a generation concludes with a cogent chapter on the consequences of those two fatal days of conflict.